The company's latest series of toy cars will feature special designs based around popular Minecraft creatures. By now, everyone knows about Minecraft: not only did the game become a huge success even before its formal launch, its dominion eventually spread to both home consoles as well as mobile phones, and developer Mojang managed to secure what can be assumed to be a very lucrative merchandising deal. 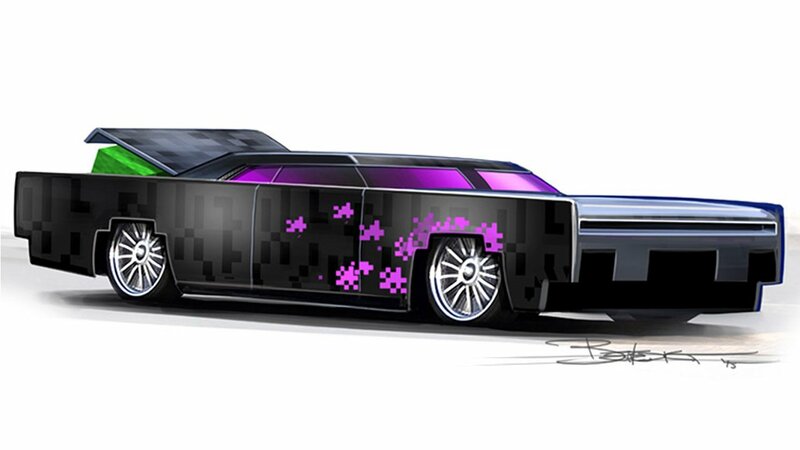 That's good news for Minecraft fans, and even better news for Hot Wheels collectors, as a new collaboration between Mojang and Mattel is resulted in the creation of a number of specially-designed Minecraft-inspired Hot Wheels. Speaking over on the official Minecraft website, Mattel designer Bryan Benedict spoke about his experience in automotive design as well his inspiration for each of the new Minecraft Hot Wheels vehicles he designed, stating that each toy design was based around specific in-game characters as well as their perceived behaviors. "It’s really about “What’s the personality of that character and what kind of vehicle type makes sense for that character? What little details can I add that really play into the story of that character?”', Benedict said. "And so the Enderman kind of wanders around aimlessly right? So it’s sort of like a lowrider vehicle that you would expect to be wandering around, just kind of cruising around... and then of course it’s got the block exposed in the trunk, with the trunk half open so you can see the block hidden in there, [because] it’s always carrying a block around." Benedict goes on to describe the Creeper vehicle being, as you might expect, creepy, and how he channeled that feeling into the intimidating-looking TNT-fueled rat rod we've featured at the top of the page. The same method was used with basing a demolition derby wagon around the Zombie character, a racecar around the Skeleton, and a Spider-based carrier truck that serves to carry around a Skeleton same as the in-game Spider Jockeys. While no specific release dates or anticipated prices were given, Minecraft fans and Hot Wheels enthusiasts alike can expect Benedict's Minecraft-inspired Hot Wheels designs to land on store shelves sometime this October. Minecraft is a prime example of an excellent video game that's approachable no matter the platform. As such, Minecraft: Pocket Edition is prominently featured on our lists of the Best Android Games as well as our list of the Best iOS Games.